“Eclectic” is one of those adjectives that makes some people go “Yay!” and others go “Uh-oh…” whenever it refers to a blues artist. Those who construe it as a synonym for “hodgepodge” may find NYC’s Stew Cutler and Friends’ music too unstructured for their taste. Where are the eight-bar, twelve-bar, and lump-de-lump rhythms? Where are the repeated couplets and refrains? Few and far between on his latest CD. Yet, for those who consider “eclectic” a compliment, Every Sunday Night will be a refreshing reprieve from the same-old, same-old. 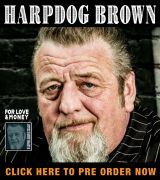 It has the right amount of weird, the right amount of woe, and the right amount of wonderful for it to be one of this reviewer’s top ten blues picks of 2017. Whether one’s preferred style of blues is roadhouse or nightclub, the nine featured songs (four originals and five covers) run the full gamut of energy and pizzazz. Those unfamiliar with Stew Cutler might be a bit skeptical of how this album got so many kudos from Ms. Rainey Wetnight, but get this. They’re from New York City. If you’re going to make it in the Big Apple, you’ve got to be more than good. 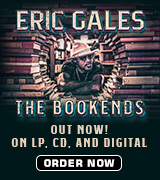 Their promotional information sheet reveals the inspiration behind this CD’s name. “‘I wanted to do a live recording in the place we play every Sunday – Arthur’s Tavern in NY’s Greenwich Village,’ [Cutler] explains. ‘However, since it became clear that it was going to be impossible to do it that way, I brought the band out to Queens and we basically played live. The overdubs and edits were kept to a minimum.’” Sometimes on live albums, their lack of polish is clear, but not here. Each track on this CD is as clean and invigorating as a late-summer rain. The “Friends” alongside lead/slide guitarist and background vocalist Stew Cutler are Bill McClellan on drums and background vocals; Bobby Harden on vocals; Nick Semrad on organ; Julian Pollack on organ for “Brookline” and “Gumbo Trane”, Chulo Gatewood on bass, and JT Bowen on lead and background vocals. The following three tracks are not only out of the ordinary, but ready for national airplay as well. Track 01: “The Grind” – Here we get a taste of the “weird” part of “eclectic,” and it’s a blast. Move over, Jimi Hendrix. Stew’s got his own psychedelic intro to top yours and then some. Running over seven minutes, this song is perfect for zoning out while consuming one’s favorite adult beverage and/or recreational substance(s). I myself can imagine it being played in a bar in the movies, one of those sketchy places that has a clock with a neon-red rim. It’s groovy and gritty all at once, never grating. Track 05: “Brookline” – Dig this smooth jazz/blues instrumental’s atmosphere. Julian Pollack’s organ adds an old-timey vibe to the mellow guitar stylings in the forefront. Stevie Ray Vaughan would also be proud if he heard this song, a “Riviera Paradise” for the NYC crowd. Track 07: “When Something is Wrong with my Baby” – Okay, this is a cover, and you-know-who doesn’t review covers on principle. Confession: Linda Ronstadt and Aaron Neville’s version of the song made her cry, and this one comes the closest to bringing back those tears. “And if I know she’s worried,” JT Bowen croons, “then I would feel that same misery.” Truer words were never spoken – or, in this case, sung with masterful aplomb ‘right in the feels’. 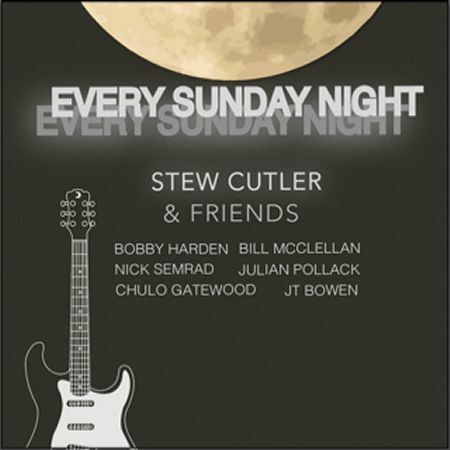 Stew Cutler and Friends play Every Sunday Night, and they still want to – in your CD player!